Fourth Row Center: Film Writings by Jason Bailey: #Sundance Review: "Detropia"
In 1930, Detroit was America’s fastest-growing city. Now, it is our fastest-shrinking. A family moves out of it, on average, every 20 minutes. Fully half of Detroit’s manufacturing jobs were lost in the last decade; they currently hover somewhere near 50% real unemployment. 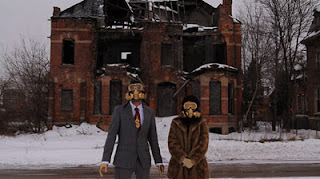 Early in Heidi Ewing and Rachel Grady’s terrific documentary examination of the city, Detropia, a charismatic blogger named Crystal Starr wanders through one of Detroit’s many abandoned buildings. She waxes rhapsodic about her fascination with the past, with being inside a structure like this and thinking about those who walked its halls before here. A few scenes later, George goes for a drive. He’s the president of the United Auto Workers Local 22, and can point out the site of the former Cadillac Assembly Plant, where he got his first job in the auto industry decades ago. The plant is long gone now, of course. Starr and McGregor are, in these scenes, like mediums; the structures and spaces around them are ghosts, rattling their chains. Ewing and Grady are deceptively casual filmmakers; as with their 2006 breakthrough film Jesus Camp, their cameras observe, but don’t comment (at least not explicitly). The pair spent years visiting and returning to Detroit, and as a result, Detropia has a lived-in atmosphere, feeling just as at home sitting in on a strategy meeting in the mayor’s office as it does shooting the breeze in the kitchen of a downtown blues bar. The film has an off-the-cuff, hanging-out vibe to it—there’s no obvious narrative, though the filmmakers adroitly avoid the kind of aimlessness that so often hinders this kind of impressionistic picture. They introduce characters (Starr, McGregor, Mayor Dave Bing, bar owner Tommy Stevens) and hang back, assembling less of a polemic than a mosaic. Think of it as Scenes from a Fallen City. Craig Atkinson and Tony Hardmon’s cinematography is gorgeous; as with last year’s Bombay Beach, Detropia uses the HD camera to discover the beauty in decay. Its photography pre-dates the Occupy movement, but it feels incredibly timely (down to an insightful monologue by Stevens near the film’s conclusion, with verbiage that’s astonishingly close to the 99% rhetoric). It concerns nothing less important than the death of the middle class, a portion of society that McGregor maintains began in Detroit and one which, if the evidence onscreen is any indication, has died there. There’s much to talk about, argue over, and ruminate on in Detropia, but it is less advocacy or exposé than portraiture—a multi-faceted, complicated portrait that offers no easy answers and no easy outs. Ewing and Grady capture something of this crumbling metropolis, and let the images speak for themselves. The result is a beautiful, thoughtful, and indisputably difficult motion picture. "Detropia" screens at the Sundance Film Festival on 1/22, 1/23, 1/25, 1/27, and 1/28. Your review made me really want to see this. I wonder if they have got a distribution company yet. Not yet. Fingers crossed, though.